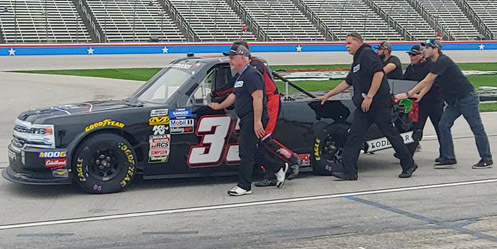 Josh Reaume picked up the 1st last-place finish of his NASCAR Gander Outdoors Truck Series career in Friday’s Vankor 350 at the Texas Motor Speedway when his #33 Colonial Countertops Chevrolet fell out with engine trouble without completing any of the night’s 147 laps. The finish came in Reaume’s 31st series start. In the Truck Series last-place rankings, it was the 4th for truck #33, the 126th from engine trouble, and the 369th for Chevrolet. Across NASCAR’s top three series, it was the 47th for the #33, the 1,065th due to engine issues, and the 1,649th for Chevrolet. Nicknamed “The African Squirrel” for his upbringing overseas, Reaume enters his second season driving for his father’s team, Reaume Brothers Racing. According to the team’s website, the effort began in 1997 to field go-karts for Josh and his brother Jonathan, and in 2018 made the jump to the Truck Series. At the time, Josh had made fifteen Truck starts, most of them with Mark Beaver’s #50. The Reaume team missed the cut at Daytona, then went on to finish a season-best 18th at Gateway. A second truck, #34, made the show at Eldora and finished 31st with Jeffrey Abbey. This year, Reaume got another run at Daytona and made the most of it. He squeezed his way into the 32nd and final starting spot, then somehow avoided the night’s many multi-truck pileups to finish a strong 6th – his first top-ten in NASCAR national series competition. In the three races that followed, however, Reaume had finished no better than a 23rd in Las Vegas, and nearly finished last with engine trouble in Atlanta. The team’s #34 was supposed to run last week in Martinsville, but was withdrawn, moving rookie Daniel Sasnett to Reaume’s #33 for a 30th-place finish. Texas saw Reaume teamed with United States Navy Reserve officer Jesse Iwuji. Iwuji, whose mother would be in attendance for the first time, made his Truck Series debut with the Reaume team at Mosport last summer, and finished 26th his last time out in Las Vegas before he was called in for training later that night. He would run the #34 Chevrolet sponsored by FuelTrax, and ultimately finished a season-best 17th, the second truck one lap down. Regardless, Reaume’s Owner Points secured the #33 the 32nd and final starting spot, bumping out owner-driver Norm Benning in his #6 Zomongo / H&H Transport Chevrolet. Also missing the cut was Bayley Currey, who was originally set to attempt all three races in Texas in a Beaver Motorsports truck, only to withdraw in a Toyota entry listed under Vizion Motorsports. The engine problem Reaume suffered in qualifying was not resolved by race day, as he was not credited with completing a single lap. There was no radio communication on the #33 team soon after the start. The rest of the Bottom Five was filled by a series of accidents on the treacherous oval. Harrison Burton backed into the Turn 1 wall on Lap 12, destroying his #18 Hunt Brothers Pizza Toyota. Angela Ruch’s first start for Niece Motorsports ended with a tangle with Martinsville last-placer Gus Dean in Turn 2, stopping the #44 The Ruch Life Chevrolet. Dean himself was out ten laps later with a wreck in Turn 4 that left him 29th. Closing out the Bottom Five was a fiery accident for newcomer Anthony Alfredo, out after 48 laps in the #54 Ceco Building Systems / Friends of Jaclyn Toyota. Alfredo, Burton, and Ruch earned their first Bottom Fives of 2019. Running 8th was Tyler Dippel, one of team owner Randy Young’s trio of young guns, who broke through with his first series top-ten finish in 8th, driving the #02 Randco Industries / Jersey Chevrolet. In 9th came Brennan Poole, turning in the best finish for both himself in eight series starts, but also for Steven Lane’s All Out Motorsports team. It was Poole’s first top-ten in a NASCAR national touring series race since his final XFINITY start for Chip Ganassi Racing on November 18, 2017. Finishing 12th was Cory Roper, who followed-up on his 5th-place qualifying run in Las Vegas by finishing 12th on the next 1.5-mile track. His #04 Preferred Industrial Contractors Ford finished on the lead lap and two spots ahead of Todd Gilliland’s fully-funded #4 JBL / SiriusXM Toyota from the Kyle Busch Motorsports stables. In addition, Ross Chastain extended an impressive streak of not only starting every race this season for NASCAR’s top three series, but finishing inside the Top 10 in all five of his Truck Series starts. Chastain finished 7th on Friday, one week after taking a stage victory in Martinsville. Finally, Garrett Smithley, running triple-duty after an arrangement with friend Robby Lyons, secured a ride in Jeff Finley’s #42 Sunwest Construction / Crown Exteriors Chevrolet. The XFINITY Series regular went on to finish 15th, the second-best finish of his career behind a 14th at Michigan, and his first Truck Series start in nearly three full seasons. *While this was Reaume’s first Truck Series last-place finish, both driver and team have each finished last once before in NASCAR competition. Reaume trailed the XFINITY race at Iowa on June 18, 2016, while driving for RSS Racing. His Truck Series effort scored the #33’s most recent last-place run on October 27, 2018, when Chad Finley’s Strutmasters.com Chevrolet was involved in an early crash at Martinsville. *This marked the first Truck Series last-place run for the #33 at Texas.